1970s: Future of the literary Bond? Forever and a Day, the new James Bond novel, came out this week. Based on material Ian Fleming wrote for an unproduced TV series, British author Anthony Horowitz placed Bond in a pre-Casino Royale era, sent to investigate murder of the man who carried the 007 number before him in the Cote d’Azur. It is not the first time that Ian Fleming Publications decided to look backwards. Devil May Care, published in 2008 to coincide with Fleming’s centenary, put Bond in 1967, after the events of The Man With The Golden Gun. 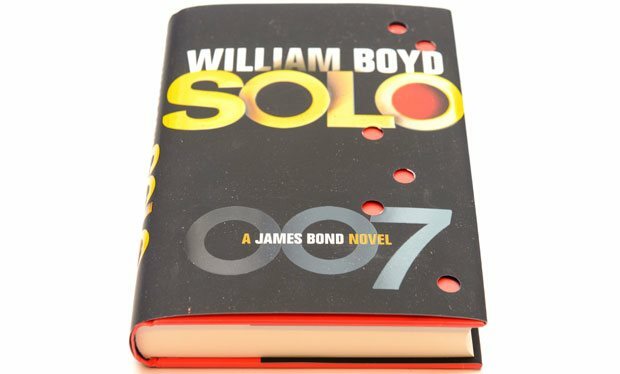 Solo (2013), by William Boyd, saw Bond in 1969 after the events of Kingsley Amis’ Colonel Sun. Horowitz’s first 007 novel Trigger Mortis (2015) was a direct sequel of Goldfinger in 1957, taking as reference the unused Ian Fleming treatment Murder on Wheels. On the other hand, IFP tried to do the exact opposite in 2011 with Jeffery Deaver’s Carte Blanche, where a rebooted Bond in his early 30s dealt with organized terrorism in the 21st century. After Ian Fleming and Kingsley Amis, Bond continuation authors John Gardner and Raymond Benson set 007 stories from the early 1980s to the early 2000s without rebooting while escaping the reality that Bond should be an elderly man in those adventures. Much like The Simpsons, 007 remained the same age for years. So, what should be next in store for the literary James Bond? The answer seems obvious but not less interesting: the 1970s. In that decade, three literary Bond pieces were published. In 1973, we had John Pearson’s The Authorized Biography of 007, a fictionalized encounter between the author (Fleming’s biographer) and the “real” Bond, who checked or contradicted facts about the previous novels. Later in the decade (1977 and 1979) saw the publication of Christopher Wood’s novelizations of the James Bond films he wrote: The Spy Who Loved Me and Moonraker, respectively. The novelizations were officially titled James Bond, The Spy Who Loved Me and James Bond and Moonraker. Although these were adaptations of the movies, they had few ties with the 1970s. Between 1968’s Colonel Sun by Kingsley Amis and 1981’s Licence Renewed by John Gardner, there were no original James Bond novels. That’s why it would be a lucrative and accurate alternative for the post-2018 literary Bond to follow, the possibility of taking an interesting and creative angle. The 1970s were a politically convulsed era where a James Bond story could perfectly fit. In 1974, a longtime ally of Great Britain, the United States, was affected by the Watergate scandal that ended with the resignation of President Richard Nixon. Also during the decade, the CIA came under scrutiny by reporters and the U.S. Congress. 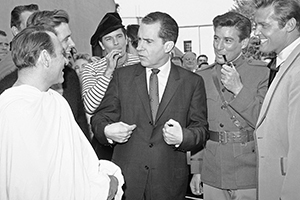 Richard Nixon, with Efrem Zimbalist Jr. and Roger Moore, while campaigning for president in 1960. He wouldn’t be elected until 1968 and was forced to resign in 1974. In the rest of the world, Latin American countries were ruled by dictators: Augusto Pinochet in Chile, Jorge Rafael Videla in Argentina (this junta would lead to the Falklands war with the U.K. in 1982) and Hugo Bánzer Suárez in Bolivia, to name a few. All these governments had their origins in the early or mid-1970s, something that should serve as the background for an original Bond plot. The novels have utilized such settings. William Boyd’s novel Solo has Bond dealing with a civil war in a dictatorial African nation of Zanzarim. Prime Minister of Rhodesia Ian Smith declared the independence of his country in 1970, cutting its last link with the British Crown. This created a conflict with the British PM Harold Wilson, who refused to recognize the new regime of the African nation and was backed by the United States. Also in the 1970s, England was the target of many IRA bombings which could also serve as a background for a more British-oriented plot. Munich suffered a terrorist attack during the 1972 Olympic Games executed by a Palestinian cell that ended with 11 athletes killed and convulsed the whole world. The 2005 film Munich, starring Eric Bana and Daniel Craig, dealt with the revenge mission taken by the Mossad years later. Bond may not be related to the Olympic Games but terrorism has been the enemy in John Gardner novels like For Special Services, COLD and Win, Lose or Die and, of course, the recent films like The World Is Not Enough, Casino Royale, Skyfall and SPECTRE where terrorist attacks have played a major role (MI6 being bombed twice). By the end of the decade, in November 1979, employees of the U.S. Embassy in Tehran were kidnapped by followers of the new leader Ayatollah Khomeini for more than a year. Some embassy employees managed to escape thanks to the Argo operation executed by the CIA with the aid of Hollywood which faked the production of a film in the region. It is known that British diplomats aided in the mission, despite being written out of the 2012 Ben Affleck movie. Bond, known for bearing a diplomatic passport on occasions, could have been directly or indirectly involved in this operation. In a decade shaken by social, racial and political events there could surely be a place for the literary Bond. The decade of the 1970s was not a part of any of the 40 James Bond novels published to date (not counting the novelizations or Young Bond series). The ’70s could serve for a series of stories set year by year, resulting in 10 James Bond book written by Anthony Horowitz or whoever who follows him and, perhaps, adapting more unused Ian Fleming material. The 1970s, done right, would be a perfect gold mine for any creative storyteller to place James Bond in. Ian Fleming Publications has tweaked its strategy for James Bond continuation novels after it was announced today a second Anthony Horowitz 007 story will be published in 2018. Horowitz penned Trigger Mortis, published last year. With the new, as yet untitled story, Horowitz becomes the first Bond continuation novel to have more than one Bond tale published since Raymond Benson wound up his 1997-2002 run. Benson wrote six novels and three 007 movie novelizations. The author exited after new Ian Fleming family management took command of IFP. Following Benson’s final original novel, The Man With the Red Tatoo, and his final novelization, Die Another Day, the “adult” literary 007 took a hiatus. IFP developed a series of Young Bond novels and other projects, such as The Moneypenny Diaries series. Since 2008, the 100th anniversary of Fleming’s birth, IFP has published Bond novels as “events,” penned by a name author. Sebastian Faulks, Jeffery Deaver and William Boyd all took turns, each doing a one-off and each taking place in different time periods. Horowitz’s Trigger Mortis initially appeared to follow that pattern. Trigger Mortis had something the others didn’t — some Ian Fleming material developed for a never-made 007 television series. It also tied into Fleming’s Goldfinger novel. However, Horowitz was asked back. His new effort “will again feature previously unpublished material by Fleming,” according to the announcement. The most prolific 007 continuation novel author was John Gardner, who wrote 14 original novels and two movie novelizations published from 1981 to 1995. The first non-Fleming Bond novel was 1968’s Colonel Sun, written by Kingsley Amis under the pen name Robert Markham. Here’s an excerpt of A STATEMENT ON IFP’S WEBPAGE. Since 2008, the 100th anniversary of Fleming’s birth, IFP has mostly commissioned period Bond novels. Offerings by Sebastian Faulks (Devil May Care) and William Boyd (Solo) were set in 1967 and 1969 respectively. The one exception was Jeffery Deaver’s Carte Blanche, featuring a timeshifted Bond in the “present day” of its 2011 publication. The move continues IFP’s strategy of a series of one-offs featuring “adult” Bond while also commissioning “Young Bond” novels and other projects. IFP management changed in the 2000s. For a long period before that, it employed an author to do an ongoing series of “timeshifted” Bond novels written by John Gardner, which ran from 1981 to 1995, and Raymond Benson, from 1997 to 2002. After Benson’s finale, the literary “adult Bond” went into hibernation until Faulks’ 2008 novel. None of the Bond continuation novels has drawn any serious interest from Eon Productions, which produces the 007 films. The publication of the Horowitz novel will come shortly before Bond 24 is set to be released. Two authors of James Bond continuation novels, Jeffery Deaver and Raymond Benson, have edited a new anthology of spy stories. Nuclear brinksmanship. Psychological warfare. Spies, double agents, femme fatales, and dead drops. 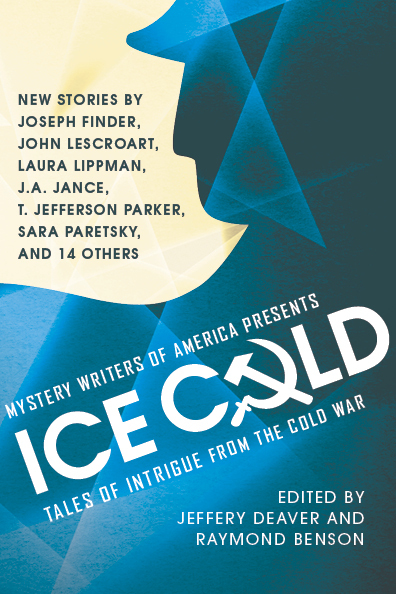 The Cold War–a terrifying time when nuclear war between the world’s two superpowers was an ever-present threat, an all-too-real possibility that could be set off at the touch of a button–provides a chilling backdrop to this collection of all-new short stories from today’s most celebrated mystery writers. In Joseph Finder’s “Police Report,” the seemingly cut-and-dry case of a lunatic murderer in rural Massachusetts may have roots in Soviet-controlled Armenia. In “Miss Bianca” by Sara Paretsky, a young girl befriends a mouse in a biological warfare laboratory and finds herself unwittingly caught in an espionage drama. And Deaver’s “Comrade 35” offers a unique spin on the assassination of John F. Kennedy–with a signature twist. The hardback book has 400 pages. It goes on sale on April 1 with a $25 price. You can CLICK HERE to see the book’s listing on Amazon.com. Deaver wrote 2011’s Carte Blanche, which featured a rebooted James Bond and had no continuity ties to any previously published 007 novel. Benson was the author of continuation novels from 1997 through 2002, and also penned some movie novelizations and short stories. The author did a review of Skyfall that ran on this blog on May 15 and has contributed to the Her Majesty’s Secret Servant website and alt.fan.james-bond. The very title hints that in this story Bond will not have the usual caravan of allies to help him, but that he will have to rely on his wits alone. The question is: is this an enticing and novel premise? A brief glimpse into the Bond universe that precedes Solo shows us that Bond, of course, is not averse to going rogue. It’s a major aspect of On Her Majesty’s Secret Service and The Living Daylights, if we remain within the Fleming canon, and it crops up now and then elsewhere too (even in the Gardner novelisation of Licence to Kill, if you accept that as canon!). Solo, then, is already potentially on the back foot, since it promises an original concept which itself lacks originality. Nevertheless, the idea of a truly rogue Bond is an appealing one. The idea of a period Bond novel which tries to move away from the formulaic issues that will plague any long-running series is also pleasing. The plot sees Bond sent by M on an assassination mission to stop civil war in a fictional African country. Bond is aided along the way by a woman called Blessing and abetted by a scarred villain called Jakobus Breed (wherein the initials J.B. can hardly be a coincidence). Suffice to say that once Bond finds himself in Africa—and, later, the USA—he is beset by the usual dangers that we would expect Bond to face on one of his adventures. First the titular tease of Bond going solo does not manifest itself until quite late in the novel, which means, among other things, that the book feels rather imbalanced—a work of two halves. There is nothing intrinsically wrong about that (Casino Royale, for example, is structurally very curious, but Fleming manages to make it work). But for a novel that claims to be different one would expect the author to embrace that difference from early on in the tale. Even when he supposedly goes solo, Bond is hardly alone for most of those chapters. None of his actions really differ from how he would usually behave. So he is doing these things without the permission of M. So what? A true rogue Bond should be doing things, surely, that fall outside the remit of his 00 status, to go to extremes for the sake of justice. Instead, Boyd sends Bond on a formulaic jaunt to America, the main problems he faces being trying to obtain a driver’s licence and weapons without support from Q Branch. Second, Bond spends a long time in this book looking at other people doing things. 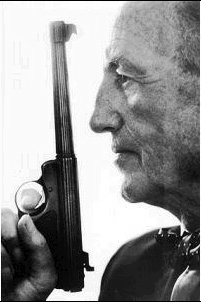 Fleming’s Bond was never really a watcher. He is an impatient man, whose idea of fighting the foe is, more often than not, to barge in and rely on his wits, strength and luck. Boyd’s Bond is more of a detective, spending several chapters of the first half of the novel sitting in a town and letting things happen around him. Instead of a blunt instrument, Boyd’s Bond is a refined instrument, cold and clinical rather than hot and passionate. There is literally one part of the novel which consists of four chapters of Bond looking at a building from another building. Fleming’s Bond, I feel, would have got bored quickly and would have sought that white-hot thrill of danger and the threat of death. Moreover, whilst Bond novels are always about more than just action and death-defying escapes, Solo is light on action scenes. Bond hardly gets into a fight at all. Sometimes when the plot looks as if we’re building up to an exciting sequence, the author pulls back and the action either doesn’t transpire, or it is dealt with perfunctorily. Not that Solo shies away from violence but this violence is frequently rather static rather than being the kind of thing we expect of a page-turner. In particular, the final climax is over and done with abruptly and any tension that has been cranked up prior to this point drains away unsatisfyingly. Third, while the geopolitical aspects of the novel’s story are a refreshing change from anything involving nuclear bombs, the plot verges at times on being dull. This is because the plot revolves around issues such as who is funding the rebellion, and it’s hard to get one’s blood pumping about something that mundane. Fleming was excellent at character-driven action, whereas Boyd often sticks to plot-driven action. The sheer number of named characters in the book (including a bewildering number of chauffeurs) hints at this. I found it strangely hard to care when certain characters got killed off or certain other characters turned out to be bad ‘uns. This is a pity, since there are lots of interesting (or potentially interesting) characters here—especially Breed, the “man with two faces”—but I yearned for there to be more actual stuff happening between them and Bond. Boyd doesn’t always tie his plot strands together very satisfyingly. Nowhere is this seen more clearly than in the case of a major female character whose numerous interactions with Bond ultimately serve only to fulfil a minor plot requirement. Surely the overarching plot of any novel of this type should bring all the plot strands together, somehow, and in a pleasing fashion, at the end? Instead, a lot of this (rather long) novel’s story feels superfluous and disconnected. Let me clarify that I still enjoyed reading Solo, for the most part. Boyd’s great skill as an author is in setting a scene, and some of the most pleasing sections of the novel are where Bond has a particularly fine meal or had a stiff drink. Boyd can cause the reader to salivate via an adroit turn of phrase. There are also some chilling and moving descriptions of the plight of the fictional African civil war on the civilians, and a disturbing sequence where Bond tries to help some villagers who are on the verge of starving to death. Boyd also strives for realism, and much of the novel gives a detailed procedural account of how an intelligence operative might deal with the situation. I appreciated the research that Boyd has gone into, and the detail adds to the atmosphere. On the other hand, Boyd’s adherence to realism means that there are almost no fantastical elements to this story. Whilst I did not expect any giant squids or gardens of death, I believe that good Bond stories set themselves apart from the crowd by being able to include fantastical elements without descending into pastiche. Solo is down to earth, for the main part, and there is almost nothing here that could be termed spectacular. Glimpses of Fleming-like plot details late in the day give promise, but are ultimately overshadowed by the more pedestrian aspects of the story. Solo could be described as a character study of Bond rather than a Bond adventure. Nevertheless, I don’t suspect most people pick up a Bond book for a character study. To me, the insightful investigation of Bond’s inner workings fall flat when put against the book’s failings. More often than not the plot rambles and the action is flaccid. I realised, after finishing the book, that I was more able to accept the structural and narrative idiosyncrasies of Solo if I conceived of it as not being an action thriller, but rather a whodunit of sorts. Bond is much more the detective than the physical hero. If you go into reading this novel without expecting the derring-do we might otherwise expect of James Bond, but instead see it as a slow unravelling of a complex plot, then perhaps it would feel less strange. That said, the key part of any whodunit is the great reveal, and ‘the reveal’ here, when it comes, didn’t excite me. In a novel where Bond meets one of the villains only once, about a third of the way through, it’s hard to be that gripped by a plot twist. It seems likely, going by Ian Fleming Publications’ current business model, that William Boyd will not write another Bond novel. That would be a shame, if only that several plot elements are left unresolved here, and as such it feels incomplete without a continuation of the tale. Also, Boyd clearly knows his Bond very well, and his writing style is fresh and highly readable, and perhaps in a different novel the same flaws might not arise again in a sequel. However, ultimately I see Solo as the third part of a disconnected trilogy of lacklustre Bond continuation novels—following from Devil May Care and Carte Blanche—which have played with the character and with the formula in various ways, but on no occasion truly succeeding. The more experimental Bond novels of late, specifically the Young Bond and the Moneypenny novels, have, in my view, been far more successful than the ‘adult Bond trilogy’ as sources of entertainment because they have nailed both the character and the spirit of Fleming’s creation in a way that William Boyd hasn’t succeeded. What’s the future of 007 continuation novels? 007 authors William Boyd and Sebastian Faulks and friend. Another James Bond novel has been published. So where does the series go from here? Ian Fleming Publictions (formerly Glidrose) has been all over the place. From 1981 until 2002, continuation novels by John Gardner followed by Raymond Benson were published pretty much on a regular basis. A new regime then took control of the literary 007 and that changed. The literary secret agent went on hiatus while novels featuring a young James Bond and The Moneypenny Diaries were published. Since 2008, and the return of an adult Bond, Ian Fleming Publications has veered from period piece (Devil May Care) to total reboot (Carte Blanche) back to period piece (Solo). The only thing the novels have in common is name authors: Sebastian Faulks, Jeffery Deaver and William Boyd. The question is whether that strategy is working. There were reports (such as THIS ONE ON THE MI6 JAMES BOND FAN WEBSITE) that sales have tailed off in the U.K. since Faulks’s Devil May Care, published the same year as the 100th anniversary of Ian Fleming’s birth. Novels written by John Gardner and Raymond Benson attempted to maintain a sense of continuity, with stories playing upon one another. The current IFP management seems to prefer one-off adventures that have no connection to each other. Part of that stems from the choice of employing big-name authors — their James Bond will only live once. “They find it fun and enjoyable but they’ve got their own books to write.” Corinne Turner, Corinne Turner, managing director of IFP, told The New York Times in a story PUBLISHED THIS MONTH. Strictly a guess, but don’t expect another adult James Bond continuation novel soon. IFP has announced a new Young Bond series, with Steve Cole taking over from Charlie Higson. So IFP will be busy. Also, based on The New York Times story, IFP doesn’t sound like it intends to change direction for the literary adult 007. So, if IFP opts to keep going for big-name writers, perhaps it will keep 007 off the market for a while to let demand build back up. For the moment, there’s no incentive to make a major change. Eon Productions has made clear it has no interest in using continuation novels as the basis of 007 movies. Eon co-boss Michael G. Wilson criticized the Gardner novels in the 1980s and ’90s. Meanwhile, John Logan, one of Skyfall’s screenwriters, was hired to write the next two movies, the first of which won’t be out until two years from now. So the next time you read about a 007 author saying his story has “been sent to Eon,” the best-case scenario was the novel was placed on a shelf.